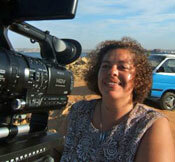 Jihan el-Tahri is an Egyptian-born, French filmmaker, author and news correspondent. Writer, director and producer, her films include the Emmy-nominated House of Saud and Do They Feel My Shadow, The Price of Aid and the recent Behind the Rainbow. She has authored, directed and produced award-winning documentary films, authored books and reported on political conflicts in the Middle East and Africa. el-Tahri is a Member of the Executive Bureau of FEPACI (Federation of Pan-African Cinema) and Secretary General of The Guild of African filmmakers in the Diaspora. She holds a Bachelor of Arts Degree in Political Science and a Master of Arts Degree in Political Science, both from the American University in Cairo. Speaking French, English and Arabic as well as some functional Spanish, Jihan was a correspondent for US News & World Report covering the Middle East while residing in France. The main stories covered were, the return of Yasser Arafat to Gaza, the Algerian elections, the Madrid Peace Conference, Desert Shield and Desert Storm (Gulf War). In 1992, she filmed Bin Laden's training camps in Sudan. el-Tahri was also a Special Correspondent for the Washington Post, The Financial Times (London), US News & World Report while in Tunisia. The main stories covered were the Palestine Liberation Organization (PLO), Islamic Movements and Algeria. While living in Egypt, she was the Cairo correspondent for The Sunday Times (London) and correspondent for the Reuters news agency.